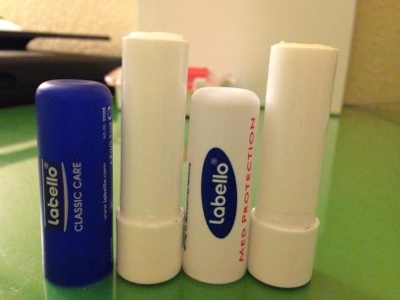 One of my absolute favorite products is Labello. I haven't been able to find it in the US, but I always stock up when I go to Italy. It leaves my lips feeling smooth, but not sticky; they get a slight gloss, and they just feel healthy. I was very upset the other day when I finished my purse Labello and the one I use at night. Luckily, I have about 1,862 at home, so I'm good, but still a sad moment. Next time you are in Europe, make sure to pick some up! Una delle mie cose preferite e il Labello. Non lo trovo negli Stati Uniti, pero', ne prendo sempre tanti quando vado in Italia. Mi lascia le labbre belle morbide senza essere appicicose. Ero molto triste l'altro giorno quando ho finito due dei mie Labelli. Meno male che ne ho 1,862 a casa, allora sono a posto, pero', ero comunque' triste. La prossima volta che sei in Europa, prendti del Labello!